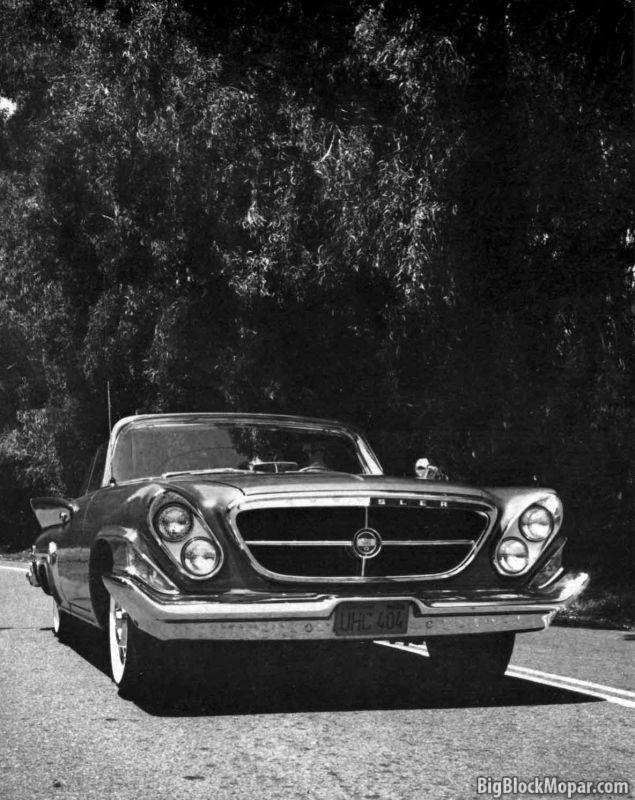 Chrysler “300” series cars have, from their beginnings even years ago, been truly outstanding machine for a very special type of ownership. The 300-G for 1961 continues the tradition established with the A through F models and offers the ultimate in high performance, along with comfortable seating for four adults. But the most remarkable feature of the 300 series, aside from performance, is the factory-engineered suspension modifications, which make this the best high speed “road car” on the market today. This will be discussed in detail later. A bonus feature of the 300-G is, of course, the special interiors which provide truly luxurious accommodations. Although the 300-G uses standard Chrysler sheet metal throughout the body, it does have its own distinctive front end and grille. There are two body types available: the convertible as tested here and a 2-door hard top. The standard engine is a modified 413-cu-in. 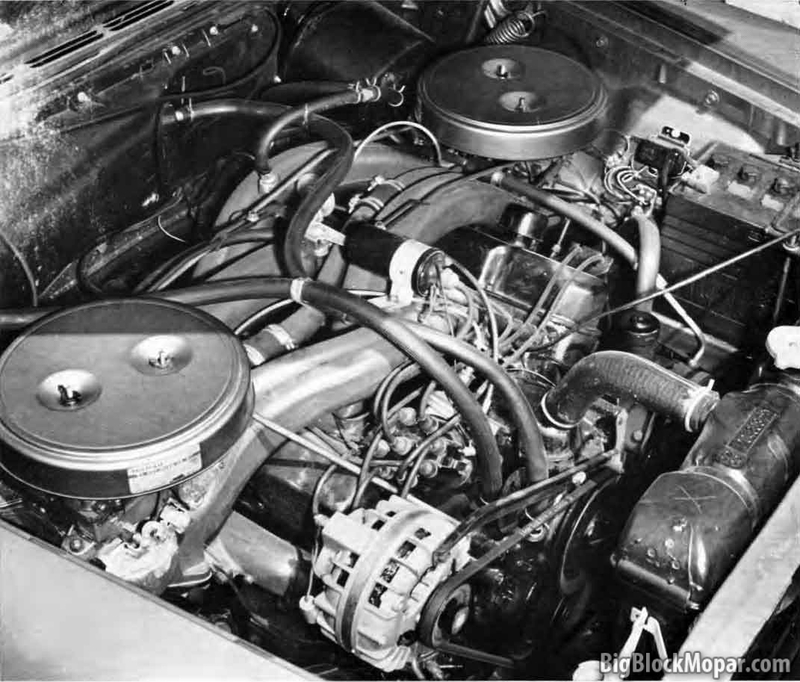 Chrysler V-8, developing 375 horse power and coupled to Chrysler’s 3-speed TorqueFlite automatic transmission. A super-hot engine with 400 bhp is also available, as well as (for this year) a heavy-duty 3-speed manual transmission, designed for the man who likes to think for himself. Our test car had the 375-bhp powerplant and the automatic transmission. Needless to say, it goes like the proverbial rocket and during the performance tests, we felt very nearly like Alan Shepard. While we wore no “G” suits, we left the starting line with impressive wheelspin and our “G” meter (the Tapley) readily spun around past its peak reading of 600 lb/ton, equivalent to over 0.6g. 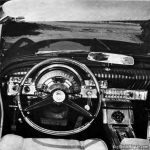 The 0 to 60 time is a creditable 8.4 seconds and, as a special stunt, we once recorded 0 to 60 in 7.7 seconds by the simple experient of leaving the button for 1st gear pushed in, and over-revving the engine to very nearly 6000rpm. Top speed for a car of the Chrysler’s capabilities is rather academic. Our rating of 131 mph at 5000rpm is undoubtedly very close to its true potential in showroom stock condition. Specially prepared 300s have hit 150mph at Daytona, of course, and the option al 2.93 axle would give a few extra mph at the top end. The performance superiority of the 300 series over other cars stems from the substitution of a relatively small number of parts for the standard items, but in key locations. Notable among these are the cam shaft and valve springs in the engine, along with the intake manifolding and carburetion. 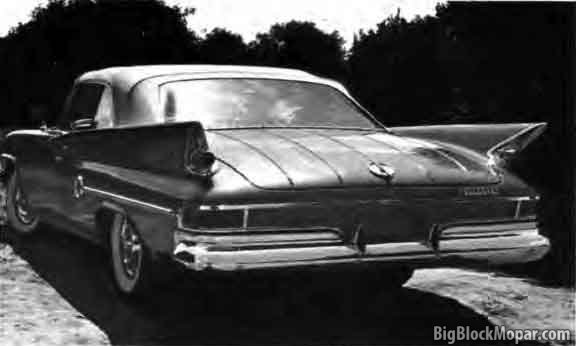 Dual exhausts complete the list of basic engine changes over the standard version . By using a camshaft of 268° duration (standard has 252°) in combination with slightly stiffer valve springs, the breathing ability in the upper rpm ranges is enhanced in order to take advantage of the increased carburetion offered by two 4-barrel units. The result of these modifications, along with the dual exhaust system, is horsepower conservatively rated at a mere 25 ponies more than the standard engine, along with a torque increase of 25 lb-ft. Out on the road, the performance of the car belies this mild increase in rating, with acceleration, top speed and cruising ability indicating that there is at least one car that runs as fast as its “paper horsepower” would lead you to think it should. In connection with the above, we believe, as a result of some considerable experience with Chrysler products, that the standard 413-cu-in. engine is somewhat overrated at 350bhp; the 375-bhp rating of the 300-G is accurate; and the “super” option (400 bhp) may possibly be over-conservative. This 400bhp option is available at extra cost and consists of a special cam shaft, mechanical lifters and slightly larger carburetors. Thus, three camshaft grinds are available for the 413 engine; stock at 252° duration, semi at 268° for the 300-G model, and full-race at 284° as a special option. While the optional 400-bhp engine would be a real tiger on the road, readers should note that it develo ps much Jess to rque at a much higher peaking speed (465 lb-ft at 3600). As we said earlier, one of the most remarkable features of the car is its high speed roadability. This roadworthiness is achieved by increasing front torsion bar and rear leaf spring stiffness. Still, the much sought-after “boulevard ride” is very much in evidence. 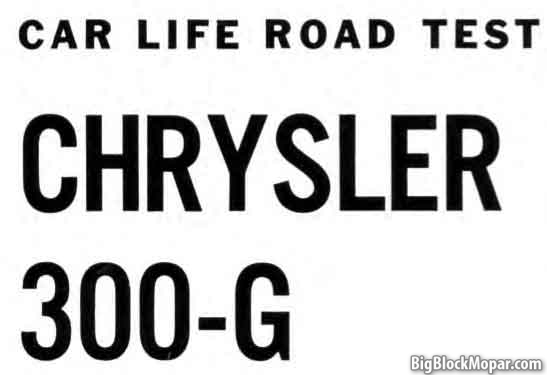 Why all Chrysler products don’t come with 300-G suspension settings we’ll never know, because there’s nothing at all objectionable about the way the 300-G rides. Spring rates at the wheels are raised from the standard settings in front of .125 lb/in. to 165 lb/in., while in the rear the difference is less: 175 lb/in. versus 190 lb/in. Shock absorber piston diameter on standard Chryslers is exactly 1 in. while 300s have 1.38 in. diameter piston shocks. The effect under normal conditions is well-nigh undetectable, but let the road get twisty, and the difference is pleasantly apparent. In fact, it is fair to say that once the driver gets used to the size of this machine, he can treat it exactly like a sports car and put it through fast bend s and corne rs with remarkable ease and in perfect safety. The steering is quick, light and accurate. Understeer is there, just enough to give one a warning that he is approaching the limit of adhesion, yet the rear end has no nasty tendency to break loose unless the throttle is pushed recklessly to the floor. In short, though sports car bug s will not believe us, this car can whip all but the hottest road-racing machinery, around any circuit in the country. Brakes, of course, are another matter. 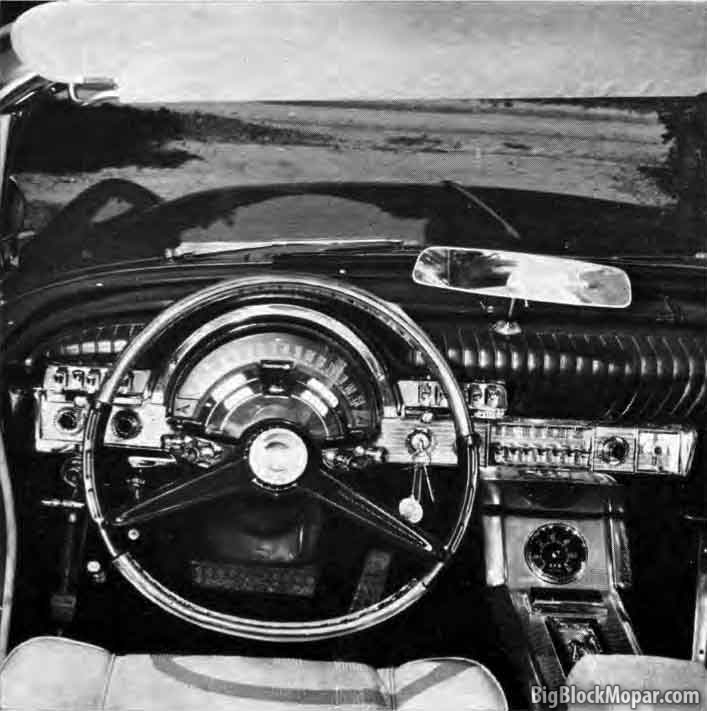 Nevertheless, we found Chrysler’s center-plane brakes to be fully up to all the driving conditions we encountered during the test, even though they would not be good enough for road racing. Anyone who expects extra braking requirements could easily substitute the Imperial ventilating hubcaps, to good advantage. For 99% of its drivers, the standard 300-G brakes will prove to be quite adequate. It might be mentioned that two leading shoe brakes, as used by Chrysler for several years , were originally developed for road racing and have considerably better anti-fade characteristics than the popular duo-servo design. In line with this sort of thinking, we feel Chrysler deserves a special pat on the back for no, using ordinary original equipment type tires on this car. Standard specification on all 300-G’s is Goodyear Blue Streaks, a very special tire , designed primarily for high- speed stock car racing. As we implied earlier, this car is capable of a performance that can exceed the margin of safety designed into standard tires. Firestone Super Sports tires could also be used on the 300-G , but we would favor the Blue Streaks also made from slighter softer rubber. On the other hand, the Super Sports tires would probably last longer and there is actually very little difference between the two. Of course, travel throughout the United States is governed (or Governed) by the legal limit on velocity; 80mph is the highest, with one or two exceptions. Original equipment tires are safe enough for an occasional venture to 100mph, but at a steady 100mph, on a hot summer day in Texas, we wouldn’t want to be in a car so equipped. The matter of fuel consumption may not be important for a car of this price, but it proved to be exceptionally good (13 to 16 mph, dependent on driving conditions). Many people are under the erroneous assumption that a “hot” engine means high fuel consumption. This is not always true – a steady cruising speed of, say, 65mph requires only 40 bhp (approximately) to overcome wind and rolling resistance, regardless of the peak bhp figure. Furthermore, an engine such as this one is often more efficient and gives better mileage under steady cruising than does a tamer, more conservative powerplant of the same size. However, with more reserve power available, a heavy foot on th e accelerator pedal means heavier fuel consumption. 1f you use the extra power you must pay for it. 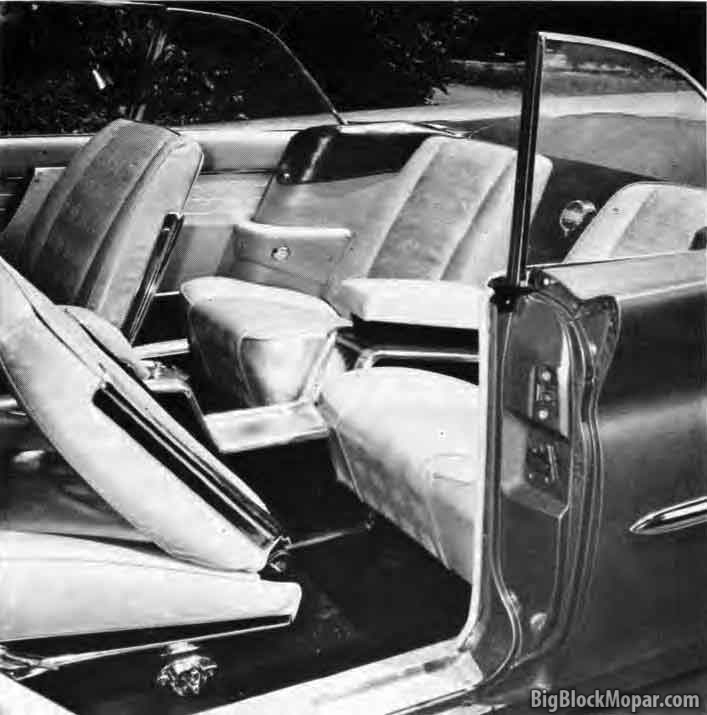 Reverting to some of the more esthetic considerations, the interior of the 300-G is impressive and, if the acceptance of this car’s principal competitor (Thunderbird ) is any guide, the individual seating for four will be a good selling point for Chrysler. Frankly, as a personal opinion, we aren’t so “sold” on the idea of a high console between the front seats, except as an anti-sparking device. Many cities have laws limiting exit from the left side door and, with an interior body width of over 6 feet, the unavailable space seems a waste. This was carried over in the rear seating arrangement, where there are 2 semi-bucket seats. While front passengers have ample space for feet, legs, hips and shoulders, the rear-seat riders don’t; foot room is cramped, leg room short and width at shoulder height limited. It seems incredible that 4 people should be cramped in a car this large. Still, individual seats are extremely comfortable and, aside from the ridiculous placement of the tachometer, (low and on top of the “tunnel”), we liked the feeling of luxury which this car gives to its occupants. Summed up, the Chrysler 300-G is a deluxe four passenger sports car or, more correctly, a Grand Turismo (Touring) type of sports car. It is big, it goes, it handles and it is remarkably economical. Equally important, perhaps, is the fact that the 300-G brings back much of the fun element to driving. We hated to part with it.